The cast of One Man, Two Guv'nors rehearses the final number of the play. Members of the skiffle band perform music in rehearsals. The Hopkins Drama Association (HDA) ended the production season with the fast-paced British comedy, One Man, Two Guv’nors. The Hopkins Drama Association (HDA) ended the production season with the fast-paced British comedy, One Man, Two Guv’nors. This show, inspired by the original Italian production, Servant of Two Masters, describes the life of Francis Henshall, an out-of-work skiffle player, played by Colin Flaumenhaft ’18. Set in 1963, in Brighton, England, Henshall is separately employed by two men and, in order to keep each of the men from meeting the other, he lives a complicated life. This production contained a highly talented cast, band, and crew and was a wonderful way to bring laughter to The Hill in the last few weeks of school. 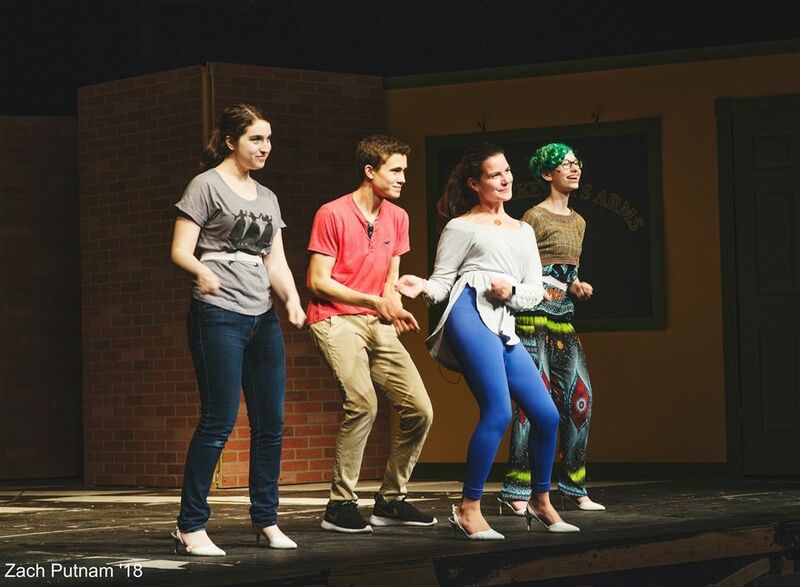 The multiple facets of this play--the comedy, the musicality from the skifle band and even the British accents--allowed the whole cast to come into their own characters.